Celebrate Earth Day by sharing your seeds and plants with the community. Meet other local gardeners, get inspired to grow delicious and nutritious food for your family. Learn which flowers to plant to attract pollinators. 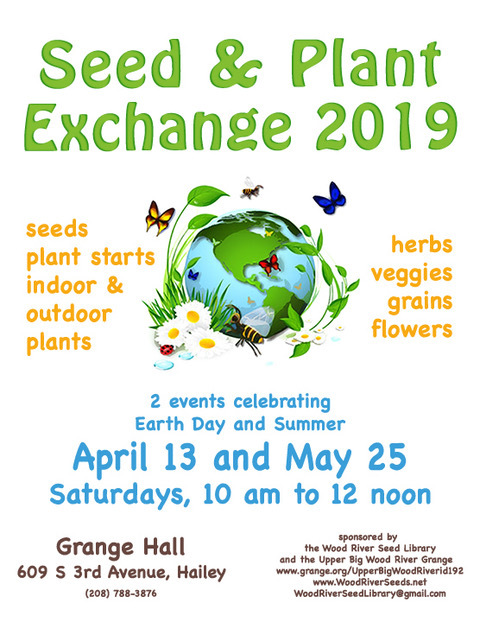 Local gardeners are invited to bring their own saved seeds, potted plants and starts, dug-up perennials from their gardens to share with the community during this annual Seed Exchange. Anyone looking for locally grown seeds is welcome to stop by the Grange and pick-up the varieties they are hoping to plant this Spring, free of charge, but donations to The Hunger Coalition are encouraged. The Wood River Seed Library (WRSL) will be sharing the seeds grown and harvested by local seed savers. Gardeners are encouraged to plant these seeds, learn the basics of seed saving, harvest the seeds from the plants they grow and return their surplus of locally harvested seeds to the WRSL in the Fall. Locally produced seeds are adapted to our local environment and weather. By preserving and sharing these seeds, our seed library maintains a vibrant and diverse supply of open-pollinated varieties for local gardeners. WRSL also shares its collection of seeds through The Community Library in Ketchum from April to July.